Staff treated you like part of the family. Amenities were perfect. Everything you could wish for in one location. Return to Paradise is hard to fault, the location and scenery is absolutely beautiful. The staff were so courteous, friendly and service was on point! The rooms were spacious and comfortable and the food was AMAZING!!! We will definitely return to paradise again! When it comes to planning island holidays, have you ever considered Samoa? This scenic island nation belongs at the forefront of your options. Palm trees surround the beaches as clear water laps on the shores of this picturesque portion of the Samoan Islands in the South Pacific. Located northeast of New Zealand and southwest of Hawaii, it offers the perfect escape. While Samoa may be considered small compared to the larger Oceanic countries, it packs in plenty to fill your itinerary to the brim. If you’re the kind of traveller who likes to venture around the landscape, bushwalk through Lake Lanoto'o National Park on Upolu, then head to the Saleaula Lava Field, which is covered in molten lava from the Mount Matavanu eruption. Rather spend your holiday worshipping the sun and splashing in the ocean? 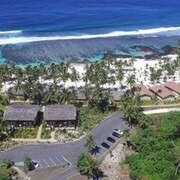 Plop down on one of the many sandy stretches along Lalmanu, Ananoa, or Paradise Beach. Once you’ve had your fair share of outdoor adventures, make your way inside and explore the exhibits at popular attractions like the Museum of Samoa, Robert Louis Stevenson Museum, and the EFKS Museum to learn about the Samoan culture and history. Whether you embark on as many tours as possible or simply rejuvenate at the beach, Samoa is certain to fulfil all your holiday desires. 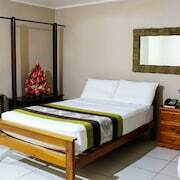 When it comes to finding Samoa accommodation, it’s OK to be picky. You have preferences to match and a budget to meet, so that’s where we come in handy. 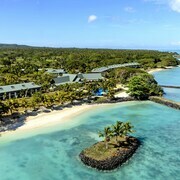 Here at Expedia.co.nz, we offer cheap deals on all kinds of lodging, such as Samoa beach resorts and inviting hotels. 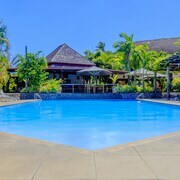 Regardless of whether you’re travelling solo or with all your rellies, you won’t want to miss out on our Samoa hotels with ocean views and outdoor pools. If a Samoa holiday sounds appealing, decide when you want to visit, and you’ll be one step closer to soaking up the island sunshine. The rainy season occurs between November and April, while the rest of the year is considered the dry season. The island boasts an average temperature of 29 degrees, so you won’t have to pack your winter jacket regardless of when you visit. Once you decide when to book your trip, fly into Faleolo International Airport (APW), which is located roughly 40 km west of Apia, Samoa’s capital. After landing, hop in a car rental, airport shuttle, or taxi to cruise to your final destination. As for island-hopping, board one of the ferries to get a taste of the nearby hot spots. 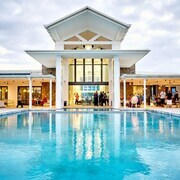 At Expedia.co.nz, we make booking your travel easy and hassle-free. 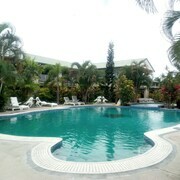 Within minutes, you can score Samoa luxury accommodation, without stressing out your bank account. 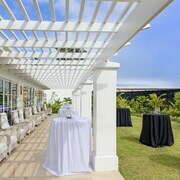 Simply browse our selection of hotel deals and pick the one that best suits your travel preferences. To save even more, bundle your lodging, flights, and car hire into a holiday package. There’s no time to wait; book your holiday today and relish the island life in no time! 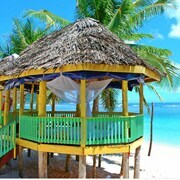 Explore Samoa with Expedia.co.nz’s Travel Guides to find the best flights, cars, holiday packages and more!